The Taylor name is synonymous with stunning tone, unparalleled attention to detail and spellbinding aesthetics. Behind their alluring and diverse instrument range is a colourful story of outside-the-box thinking and an uncompromising approach to design – read on! 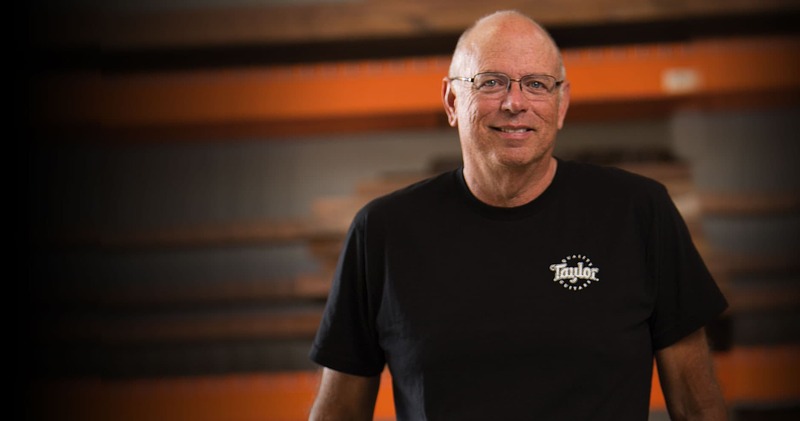 Like many great instrument builders, Taylor Guitars co-founder Bob Taylor started early. He learned what worked and what didn’t through a lot of trial and error, building his own acoustic guitars with encouragement and guidance from his high school wood shop teacher. It helped that he was working in a guitar store at the time, familiarising himself with the tried-and-tested formulae of popular instrument manufacturers. When I was a kid, I knew how to make stuff , Taylor says. I made my bicycle, I made my skateboard. When I was 16 I wanted a guitar, so I made one in the high school wood shop. And halfway through making that guitar it was like, ‘bang! I’m making guitars! That’s what I’m gonna do, because I love this.’ And that’s how I got started. When the opportunity came up to buy that very store – called ‘American Dream’ – Taylor couldn’t resist making an offer with the help of his friend and business partner Kurt Listug. They renamed the business ‘Westland Music Company’, and although it took quite several years to get going (and plenty of sleepless nights), it ultimately became Taylor Guitars – the innovative, highly-respected company it is today. Taylor’s DIY attitude was a pivotal aspect of his guitar building process. He was a keen problem solver; even when he was building his very first guitar, if he needed something done and didn’t have the hardware to make it happen, he made the hardware himself. Taylor muses on this, saying …for example, it’s time to bend the sides. What to do? Well, you need to make a bending iron, ‘cos you’re not going to bend sides without one. And now it’s time to cut a rosette. Alright, well let me set up a drill press, and I’ll set up a fly cutter, and I’ll make a rosette – so for my first guitar, I made tools. It was apparent from the get go that although Taylor was inspired and guided by popular existing designs, he wanted to do things his own way. Much of the Taylor manufacturing process is still done by hand using their unique and innovative tools. Setting the inlays, placing the bridge, painting the bodies; there are some things which still get the human treatment because that’s still the best way to get it done. At the same time, Taylor isn’t afraid of pushing the boat out, using new technology designed to streamline certain aspects of the process – acoustic tops are laser-cut, for example. Taylor explains: A lot of luthiers collect five, six, seven luthier tools and go ‘okay, I’m done,’ and to them anything past that is not making guitars any more. And I reject that notion totally and completely! Machines, machine tools, processes, fixtures, all of this, they’re fabulous in the life of anybody making anything. If it made his life easier, it was worth having, regardless of the industry standards. He continued: If I spent 40 hours making a guitar, I easily spent 40 hours making some type of tool or fixture or aid for the construction of the guitar that I could then use for the next guitar. And eventually you get to where you’re producing pretty good guitars and you’ve got this nice little shop full of specialised tools to be able to do that. In the late ‘80s, computer-aided design arrived on personal computers, revolutionising manufacturing processes for a number of industries. Not only that, but three-axis mills (a versatile workshop machine capable of working a number of materials) had reached a point where a common builder with a small factory like Taylor Guitars could afford the equipment. All those tools leapfrogged all the furniture tooling that people tried to adapt to guitar building for years, noted Taylor. You know, a bunch of crappy guitars made with these machines that are like a big hard piece of metal that don’t do anything except cut a curve – well, a guitar neck isn’t a curve – a guitar neck is really complex! It’s like a propeller or a surfboard. It’s not an easy thing to do! And some kind of simple, cast iron woodworking machine that they made for a hundred years doesn’t do the job. So those machines really sort of gave the factory guitar a bad name. He continued: …but people said ‘well, it’s because they’re machine-made.’ Well, maybe it was. But then all of a sudden, machines were available that can do a surfboard, can do a guitar neck – can do all of that! And the minute they were available, I was using that stuff. There was no spiritual or emotional conflict in me at all. It was, ‘this is what I’ve been waiting for and I’m diving in with both feet as fast as I can, and I don’t care what anybody thinks about it because this is the future of guitar building’. Taylor’s adoption of laser cutting was born from the same desire to see how far the technology could take guitar making. The company bought their first laser to make a rosette on a Baby Taylor. That’s all it did, and I thought ‘If this is all I can ever do, it’s worth buying a laser.’ But I predicted that it was gonna open the floodgates for things that we can do in the future, which is exactly what it did. We make parts on the laser that you can’t even conceive of making with any kind of traditional hand tool. You start out with these kind of machines as a labour buddy, and you end up using these machines to make guitars that you can’t make any other way. It’s apparent that Taylor saw these advanced technologies as a means of allowing total creative freedom. He was never one to give up on an idea; while some luthiers may play it safe with familiar methods, Taylor was never afraid of stepping into the unknown to achieve his goals. Now we can think of something and go ‘wait just a darn minute… we could make that part!’ Wouldn’t it be awesome if we had a little tiny thin patch of spruce underneath the top and it had eight thousandth of an inch slots cut most of the way through it in a feathered position so when the spruce expands and contracts those slots can open up and close with it? That would be one ridiculous little example, but it’s life-changing! Bob Taylor continues to innovate as part of the company to this day, based at their manufacturing facility in El Cajon, California. 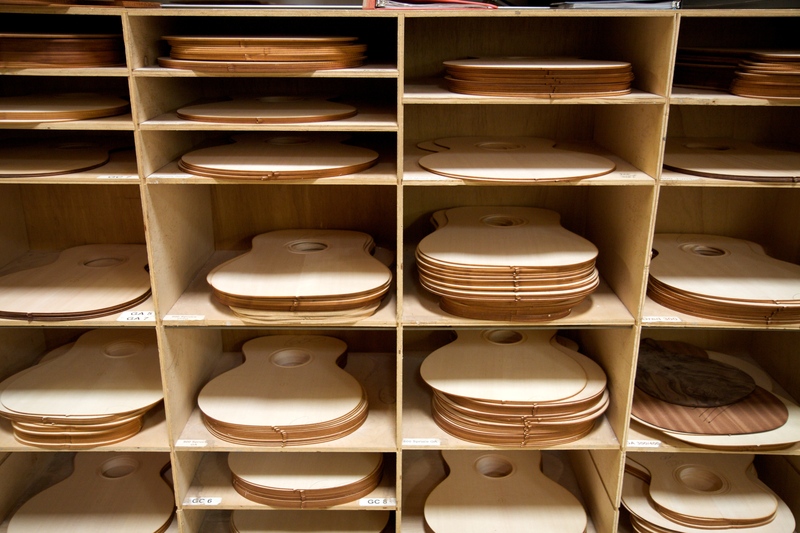 Combined with their other factory in Tecate, Mexico, the company employs over 700 people and continues to produce some of the most sought-after guitars on the market!